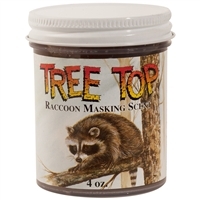 Tree Top is a great cover scent that should be used on both sides of you while in your treestand. Gel form adheres to bark for long-lasting protection. Also covers your scent that you leave behind while going to your stand. Tree Top has a strong, natural odor that works all across the U.S. and Canada. Tree Top is a great cover scent that should be used on both sides of you while in your treestand. Gel form adheres to bark for long-lasting protection. Also covers your scent that you leave behind while going to your stand. Tree Top has a strong, natural odor that works all across the U.S. and Canada. USE SPARINGLY! 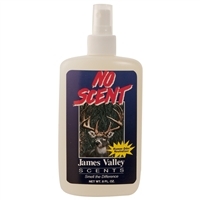 Great cover scent for big game hunters and predator callers. Scent Stopper controls odors in leather boots and leather hunting gear. Scent Stopper is a superior leather preservative and waterproofer. Silicone spooks game. Scent stopper stops human and foreign odor, preserves and waterproofs leather. Why go to extremes to keep your body and hunting clothes clean, only to have your scent-saturated boots give you away? Some products stop odors on contact. Unfortunately, they do not continue to kill odors as you produce them. Hunters constantly produce "game-spooking" odors. NO SCENT eliminates game-spooking odors. Apply NO SCENT prior to entering your hunting area, after sweating in your hunting clothes, or after being in contact with game-spooking odors. Odors are bound together at the molecular level. This product is the ultimate in human odor control. Some products stop odors on contact. Unfortunately, they do not continue to kill odors as you produce them. Hunters constantly produce "game-spooking" odors. NO SCENT eliminates game-spooking odors. Apply NO SCENT prior to entering your hunting area, after sweating in your hunting clothes, or after being in contact with game-spooking odors. Odors are bound together at the molecular level. This product is the ultimate in human odor control. Our original odor neutralizer - very concentrated. A little will go a long way. Has the same qualities as our NO SCENT. Our original odor neutralizer - very concentrated. A little will go a long way. Has the same qualities as our NO SCENT. I've trapped hundreds of these guys over the years. I know quality fox urine and the benefit it has in covering human odor. I use only strong, pure, quality red fox urine that comes from mature animals on well-balanced meat fed diets. I continuously search the U.S. for top quality fox urine. Fox Plus is a super cover scent while in a treestand, ground blind, or for covering your entry trail. Works great with NO SCENT SPRAY. I've trapped hundreds of these guys over the years. I know quality fox urine and the benefit it has in covering human odor. I use only strong, pure, quality red fox urine that comes from mature animals on well-balanced meat fed diets. I continuously search the U.S. for top quality fox urine. Fox Plus is a super cover scent while in a treestand, ground blind, or for covering your entry trail. Works great with NO SCENT SPRAY.